Scientific research continues to explore the therapeutic effects of eating dark chocolate. The polyphenols and theobromine found in cacao beans have a multitude of health benefits. Here are ten ways that dark chocolate can be used for disease prevention and treatment. The polyphenols in dark chocolate can improve blood vessel function and lower high blood pressure. In a German study, 44 patients with prehypertension or stage 1 hypertension were randomly assigned to receive 6.3g a day of either dark or white chocolate for 18 weeks. Researchers concluded that the inclusion of a small amount of dark chocolate in the patients’ normal diet efficiently lowered their blood pressure without causing changes in body weight. White chocolate had no effect. Doctors often prescribe aspirin to people with heart disease because it lowers the risk of blood clots in arteries that could lead to a heart attack. Research shows that the polyphenols in dark chocolate have a similar anticoagulant effect. In one study, participants were given either a cocoa drink, a caffeine beverage or water. Their blood was then tested. Blood platelet formation decreased after cocoa consumption but increased after caffeine and water consumption. Dark chocolate contains a compound called theobromine which has been found to be more effective than codeine for treating persistent coughs. It works by suppressing vagus nerve activity to halt the cough reflex. In a clinical trial, approximately 60% of patients given 1000mg of theobromine a day experienced relief from coughing. Unsweetened dark chocolate has about 450mg of theobromine per ounce. Chronic inflammation of cardiovascular tissues is a risk factor for heart attack and stroke. Recent research has discovered how eating dark chocolate could help reduce it. Scientists tested cocoa powders in a model human digestive tract. They found that microbes in the colon such as bifidobacterium metabolize the polyphenols in dark chocolate into easily-absorbed, anti-inflammatory compounds. The antioxidant polyphenols in dark chocolate could help protect the body against colon cancer. In a Spanish study, rats were fed a daily diet consisting of 12% cocoa. A control group was fed an ordinary diet. After eight weeks all of the rats were exposed to a toxic chemical known to induce the onset of colon cancer. Those that had been fed with cocoa had fewer pre-cancerous legions than those in the control group. They also exhibited a much higher degree of apoptosis, or normal programmed death of potentially cancerous cells. People with low insulin sensitivity require larger amounts of insulin to keep their blood sugar stable. This condition, known as insulin resistance, is a precursor to type 2 diabetes. The flavanols in dark chocolate increase the uptake of glucose in response to insulin. In a small Italian study, healthy subjects were given either dark or white chocolate bars for 15 days. Oral-glucose-tolerance tests showed that insulin sensitivity significantly improved in the dark chocolate group. Chronic elevation of the stress hormones adrenaline and cortisol has been linked to high blood pressure, irritable bowel syndrome, depression and other disorders. Research has shown that polyphenols in dark chocolate lower the endocrine (hormone) response to stressful situations. In one study, men who underwent a stress test two hours after consuming 50g of dark chocolate had significantly blunted cortisol and adrenalin responses compared to a control group given white chocolate. Oxidation of LDL cholesterol leads to the development of plaques in the arteries associated with heart disease and stroke. Flavonoids, present in dark chocolate and a variety of plants, inhibit LDL oxidation, lowering the risk of atherosclerosis. In one study, participants were assigned to either a low flavonoid diet or a diet which included dark chocolate. After four weeks, LDL was extracted from blood samples and subjected to oxidation. 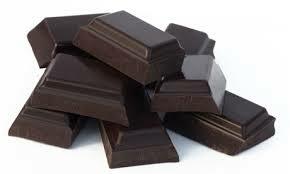 The chocolate diet slowed LDL oxidation rates by about 8% compared to the low flavonoid diet. Pre-eclampsia is a disorder of pregnancy characterized by dangerously high blood pressure and high levels of protein in the urine. The only way to cure it is to deliver the baby, making it a common cause of premature birth. Yale University researchers asked 2,500 women about their diet during pregnancy. Those who consumed higher amounts of chocolate were less likely to develop pre-eclampsia. This may be because theobromine in chocolate keeps blood pressure steady. Flavanols in dark chocolate are thought to reduce the risk of dementia by increasing blood flow around the brain and protecting brain cells from damage. In an Italian study, 90 people over the age of 70 with mild cognitive impairments were divided into three groups and given different strength cocoa drinks to consume over eight weeks. Those whose drinks contained a higher concentration of cocoa showed the most improvement on cognitive tests. This entry was posted in Just Good Stuff and tagged Blood pressure, Dark Chocolate, Good health, healthy, reduce inflammation. Bookmark the permalink.